Thursday, October 20th, 2016 will bring us the game between Chicago Bears and Green Bay Packers from the Lambeau Field, Green Bay stadium, not the most exciting or competitive game this week, but it is our Thursday Night Football and we can still win some money betting on it. Chicago Bears are coming off another loss, (they are 1-5), this time against the Jaguars 17-16. Green Bay Packers didn’t do well last week either taking a loss to Dallas Cowboys 30-16 which puts Packers 3-2 for the season. The bears had a fourth-quarter 13 lead to Jacksonville last week and failed to defend it. Chicago went 389 offensive yards and only 92 on the ground. Bears have suffered this season with injuries, their defense needs work, their offense is not bad, it actually has improved in the last few games, their main problem however is converting yards into points, they are currently averaging only 16.8 points per game. Quarterback Brian Hoyer and Cameron Meredith were the strong figures of the game. Jay Cutler (starter QB), running back Jeremy Langford and cornerback Kyle Fuller are still out for this upcoming game. Thursday may see the return of linebacker Pernell McPhee, but this is still a doubt, after his knee surgery during the offseason the Bears have a window to have him play or he’ll go back on injured list for the remaining of the season. Dallas took an easy week over Green Bay, perhaps the inconsistency of QB Aaron Rodgers had something to do with the bad performance, maybe a weak offense, or in general the decisions made by coach McCarthy; but it was mostly a superior Dallas with a great offense and the work of quarterback Dak Prescott and running back Ezekiel Elliot that took Green Bay’s usually solid defense apart. 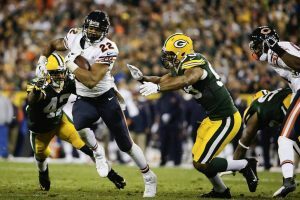 Cornerback Quinten Rollins will not be playing against the Bears, this was announced by coach McCarthy on Sunday night; but Packers are playing at home, they will be hungry to get back in track after their loss last week and their defense should have no problem against Bears’ offensive game. Last time these two teams met, Bears were able to pull the upset, but Packers have won 10 of their last 13 encounters with the Bears. Packers come into this game as the favorites to win, line stands at -9 and the over/under is 45.5. Bears desperately need a win, but theirs may be a lost cause, Packers are the better team and despite last week’s result they should be able to handle the Bears, I am waiting for that line to go down a bit more I am hoping to get a -7.5 or less. Pick: Packers and the under. Place all your NFL action at AceSportsbook.com, remember every Thursday there’s NO JUICE on the entire NFL board. Bet on NFL games, halves, props, any time and from anywhere, LIVE-IN-GAME bets are also available.